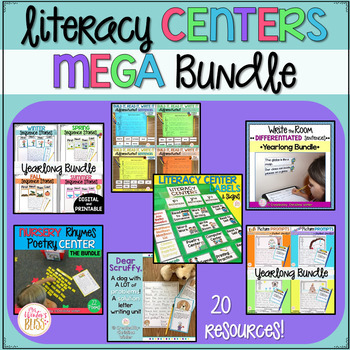 A bundle of my MOST LOVED & EASY TO PREP LITERACY CENTERS that will last you the entire year! The activities are created in a way that make differentiation a breeze! Buy them together for 20% less than if you bought them separately! Please check the preview file for a close up of all 20 of the included resources. EVERYTHING you need to get your literacy center rotation board organized in a snap! Just print the center cards to easily change out the center activities (EDITABLE VERSIONS also included)! You can also print matching labels for center material tubs or work areas. My students love this literacy center! It is a meaningful way for them to practice reading sentences with basic sight words and writing complete sentences. In addition, rereading the sentences gives students the opportunity to practice reading accurately and fluently. Since our students are at very different reading levels, I created 2 versions (emergent and advanced) of each picture. The cards with the blue stars are for more advanced readers. The simple sentences have underlined words to remind your students to use the picture cues. In my classroom, I hang the simple & advanced sentence side by side. Just as my students have been taught and are responsible for reading “good fit books” they choose a good fit sentence to read and record.